Car manufacturers introduced stop-start engine technology to help reduce vehicle emissions and improve fuel efficiency. Cars that use this particular technology are referred to as stop-start vehicles. The benefits of these cars are very clear. Yet one of the major challenges their owners face is maintaining the special stop-start battery they use. What Makes A Stop Start Battery Special? The difference between this type of battery and those used in older cars is that a stop-start battery does not contain lead acid. Instead they rely on enhanced cyclic performance which gives the battery a greater ability to recharge and discharge. What this means is that, even when the vehicle is not in motion, the stop-start battery still continues to charge the ancillary system. This unique type of battery has special features in its design. It can both provide power for the car and also recharge afterwards as the vehicle is coming to a stop. A regeneration system collects all energy created during the braking process and stores it in the stop-start battery. 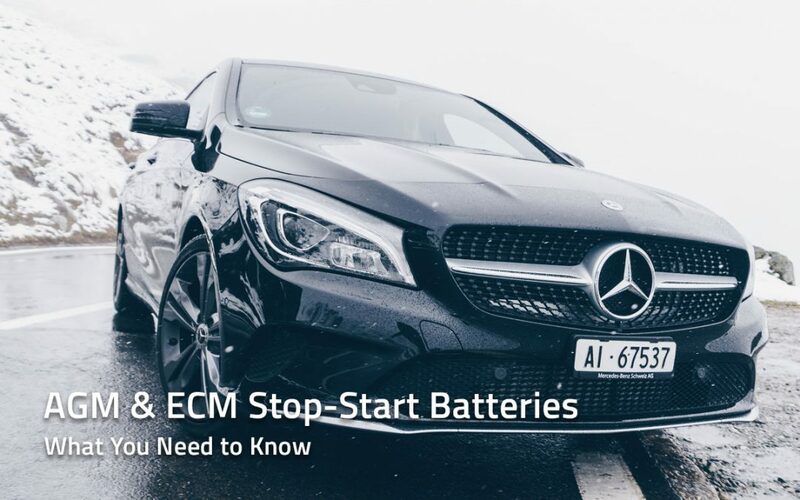 There are two different types of stop-start batteries, which are AGM and ECM. Absorbent Glass Mat (or AGM) batteries are designed for stop-start vehicles. These cars have extra technology that helps to reduce fuel consumption. AGM batteries form part of the system. This extra technology includes EMS (Energy Management System) and the brake regeneration system. An AGM stop-start battery copes well with the increased demand created by these extra systems. ECM (Enhanced Cyclic Mat) batteries are also compatible with stop-start vehicles. Even though these particular batteries may not last as long as ACM batteries, they will still last longer than a standard battery. ECM batteries also lower vehicle emissions by six percent when compared to lead-acid batteries. Stop-start batteries can keep your car running for a long period. Like all cars though, a time will come when your car’s battery will need changing, Check the specifications of your current battery and replace it with a similar stop-start battery. Make sure you stick to the same type of stop-start battery you were using, as another type of battery may affect the performance of your car. Where does your stop=start battery live? Don’t be surprised if you look under the bonnet and it’s not there! A stop-start battery can be fitted anywhere in your car, it does not necessarily have to be under the bonnet. Cars fitted with stop-start technology sometimes have their batteries located in unexpected places. So if there’s no battery in your engine bay, check your car’s technical manual. It will show you the exact location of the stop-start battery for your car’s make and model. Once you locate the battery, it is advisable that you handle it with care. Yet don’t worry about spilling any acid since the stop-start battery does not contain any. Stop-start batteries are completely sealed so chemical spillage is less likely to occur. Stop-start batteries are a bit heavier compared to standard lead-acid batteries. Make sure your muscles are up to the task, and lift with care. If you can’t handle it, take your care to your trusted mechanic. He will be able to switch batteries over for you without any problem. Understanding the type of stop-start batteries available today is critical for your car. Knowing this will help you choose which one is right for your modern stop-start vehicle. Lead acid batteries no longer make the grade. Contact us for further information on AGM and EFB stop-start batteries. Our skilled team at Battery Power Centre will help you select the appropriate battery for your car.